God, Charlton and Punk Rock: Are we nearly there yet? They say a week is a long time in football. This is true, unless of course it's the start of the summer interlude when a week just seems like a long time full stop. After a lovely summer holiday in Prague with my wife, the next 'light at the end of the tunnel' to get me through the working week will be the pre-season friendlies which start less than three weeks away at Welling. The past seven days have seen the Charlton machine gathering momentum with almost daily 'breaking news', I went to the Czech Republic blissfully unaware that every time I found a WiFi hotspot my phone would vibrate like the clappers, timelines more congested than border control at Gatwick. Before departing we had the news of the St Mirren friendly in Spain, it was then announced that the Addicks would play a second match whilst abroad, this time facing a Gibraltar XI. As much as I cannot afford (or get time off work for) another European jaunt this summer, I'm a little saddened I cannot venture to Spain. How many of us can boast we've seen Gibraltar play football at their national stadium on Winston Churchill Avenue? These truly are little football 'bucket list' gems aren't they! And as for St Mirren, well I've a true soft spot for Scottish football as a whole and The Buddies side of the early 80's did of course contain the legendary Jimmy Bone. Need I say more? Charlton, as faithful a dealer as there ever was, are still going to give me a little injection of Scotland though as they announced that for the only home friendly we will be hosting Inverness Caledonian Thistle, a side I've followed with some interest since their inception and their Highland League days, an amalgamation of two teams far more successful than anything Robert Maxwell attempted a decade earlier. Another game now confirmed is a League Cup fixture at home to Oxford United. Not something to get particularly excited about I know, given our record in the tournament and last season's poor showing against Leyton Orient. The ground will only be open in small areas, the atmosphere will be non-existent and it will, in fairness, feel like one more friendly but for me again another soft spot. And so came Monday evening, I'm at Prague airport and looking for an internet connection. I was well aware of an event taking place at The Valley, the unveiling of the upcoming season's new home shirt, the second home offering from N**e.
New signing Mark Gower along with Under 21 captain Bradley Jordan sported the new attire complemented by two very meticulous haircuts. The fantastic free WiFi in Prague's impressive if somewhat disorganized airport meant I too could share the moment with them. 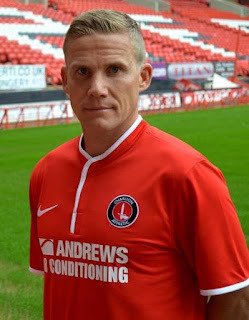 The lighter shade of red is a traditionally more Charlton colour (it's not a variant of orange we are told), the trim is white but that is where my positivity ends. The collar/neck is, we are told, buttoned at the front although they are obviously invisible when done up, this to me just makes it look like a Velcro fastening. The thin white trim on the sleeves isn't overpowering and a nice touch but I don't think we'll ever go on to consider it to be a classic, not like this beauty! The internet had been full of creations by amateur kit designers on possible new Charlton shirts, some of them ripping off old templates, others creative, fresh and intriguing. Maybe some of these big brands should take note of what's achieved on lap tops around the capital. Perhaps these ideas fuelled my anticipation and heightened my disappointment of the real thing. As all the wise old heads on twitter are quick to point out though, it's the team that matters, not the shirt and, if truth be told I wouldn't be giving N**e any of my money for one no matter how lovely a design so who am I to moan. Tomorrow morning sees the announcement of the fixture list and the final piece to shape the landscape of the impending season. People supposedly 'in the know' have already tried to leak opening day fixtures, I expect to achieve more virtual followers or friends, I'm happy to sit it out and ponder the possibilities for another twelve or so hours. Then I'll start scribbling dates on the calendar and making travel and work plans. Are we nearly there yet? Almost.